+ E-bikes are essentially regular bikes that also include a small electric drive, and battery, that helps propel the bike forward. + There are different classes of e-bikes based on how their power and how they operate. The class that's currently up for legalization are "pedal-assist" e-bikes. They only go if you're pedaling, and the assist tops out at 20 mph. + E-bikes hold the potential to stretch the idea of what a bike is for people in all sorts of different ways. They can make commuting faster and relatively sweat-free. They can help people conquer hills without straining themselves. They can make bikes an option for people who have physical constraints that would otherwise make them wary of riding. + You can buy an e-bike in New York State right now -- there are multiple local shops that sell them -- but they're not technically legal to ride on streets. (New York City recently moved to allow pedal-assist bikes.) Your chances of being hassled for riding one probably aren't high. But the big issue is that without legalization, bike share systems won't adopt them. + And bike share could be the e-bike application with the most impact because it would introduce the bikes in all sorts of use cases and make them available to people who might not be able to otherwise afford them. "They're a viable transit option that provides access for people underserved by public transit, and they offer point-to-point commutes for riders," said Joanna Jacob at a press conference in Albany's Academy Park Wednesday. She's the policy and communications coordinator for Jump Bikes (formerly Social Bicycles), the company that provides the bikes and system for CDPHP Cycle here in the Capital Region. At Wednesday's event bike advocates touted the potential of e-bikes, and with New York City already moving to allow the bikes, framed the legalization issue as a divide between NYC and the rest of the state. 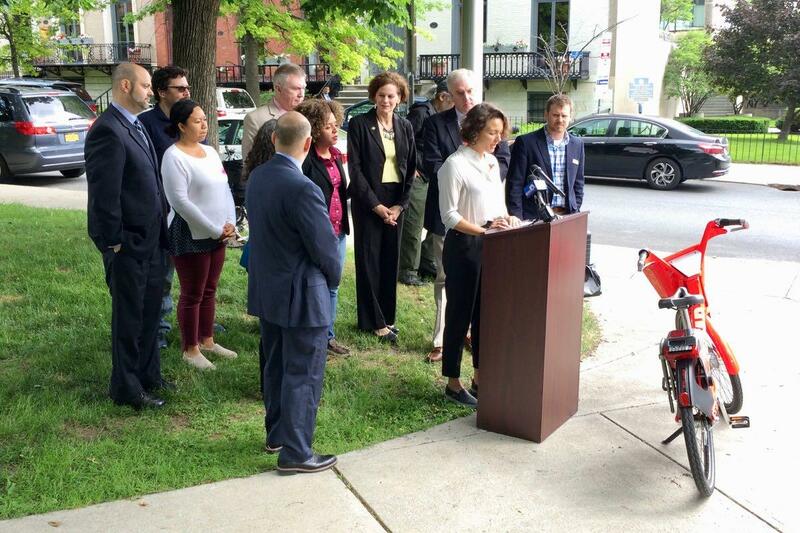 "If lawmakers don't act and pass a law now, the rest of the state outside New York City... we will once again be left behind," said New York Bicycle Coalition board president Leah Golby. "That will create a negative impact for residents, local businesses, and tourists alike." Among the officials speaking Wednesday was Assembly member Pat Fahy, who represents a large chunk of the county and city of Albany. She is herself a frequent cyclist -- it's not usual to see her roll up to an event on a bike -- and she's been a vocal supporter of e-bike legalization. "It's been challenging [getting legislation moving on this topic], but I think there's growing support for it as people get educated about it," she said after the press conference. There are two e-bike bills in the state legislature. One -- sponsored by David Gantt of Rochester, chair of the Assembly's transportation committee -- would allow pedal-assist e-bikes, but would require helmets and restrict their use, for both riders and passengers, to age 16 and older. (The age restriction is a potential issue for parents using cargo bikes to transport kids.) The other bill -- sponsored by Assemblyman Nick Perry of Brooklyn -- would allow pedal-assist e-bikes and does not include the helmet and age restrictions. Bike advocates -- notably the New York Bicycle Coalition -- have lined up behind the Perry bill, and its counterpart in the Senate has passed previously and moved out of committee again this year. But it was the Gantt bill -- the one with the restrictions -- that was moved out of the Assembly's transportation committee this week. Fahy said she's OK with that. "I am one that believes let's get the camel's nose under the tent. Let's get it moving," she said, noting that a bill can always be amended later -- but it's better to have something rather than nothing. "I'm optimistic, we're going to keep working it over." One potential scenario for the legislation is that legislature ends up rolling together a whole bunch of bills into one big end-of-session package -- a "big ugly" -- and the two e-bike bills could be reconciled during that process. But it's the state legislature, so who knows. CDTA's Lauren Bailey on a test ride. OK, let's say e-bikes do get legalized in New York State. What would that mean here in the Capital Region? Well, CDTA is eager to incorporate the bikes into its bike share program. 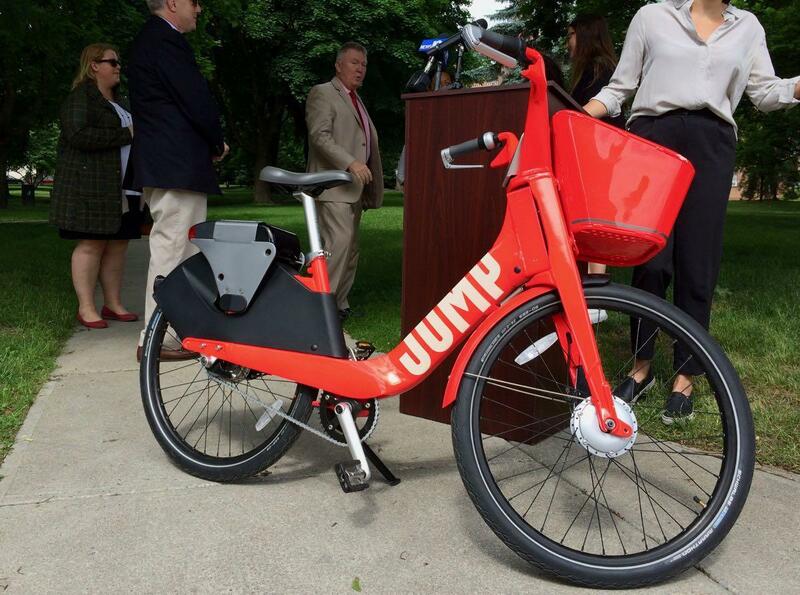 CDTA mobility manager Lauren Bailey -- who's been overseeing bike share -- says the transit org has already had preliminary conversations with Jump about e-bikes, and she described the possible inclusion of the bikes in CDPHP Cycle as "a real game changer for the way people get around." Of course, the e-bikes would also have to be charged somehow. Jacob said Jump has a bike rack model that incorporates charging and it can be plugged into a standard power outlet, so it wouldn't require a special power supply. (She said Jump's operation in Santa Cruz, California will be plugging into outlets on street lamp poles.) The bikes can also be charged overnight in storage -- the charging process takes about 2-3 hours -- and then redeployed again during rack rebalancing for the next day. She said a charge is enough for 20-40 miles of use depending on conditions. The fee structure for the e-bikes would be roughly similar to what's in place now. The first 30 minutes would be $2, then each minute after that is prorated for an hourly fee of $4. Uber -- Jump's new parent -- has been, let's say, bold in its approach to dealing with regulation for its ride-hailing services. But without legalization, Jacob said the company is not willing to deploy e-bikes beyond New York City in the Empire State. "We work with cities, we work with governments. We're not trying to go rogue." E-bikes are growing in popularity here in the United States, but they're still relatively new as part of city-scale bike share systems. And there are a handful of companies trying to claim a slice of that market. Jump is currently operating e-bikes in San Francisco, Washington DC, Santa Cruz, and Sacramento, with Providence planned for this summer. "People love [the e-bikes]," said Jump's Joanna Jacob Wednesday. "The usage, especially in a city like San Francisco, is through the roof. 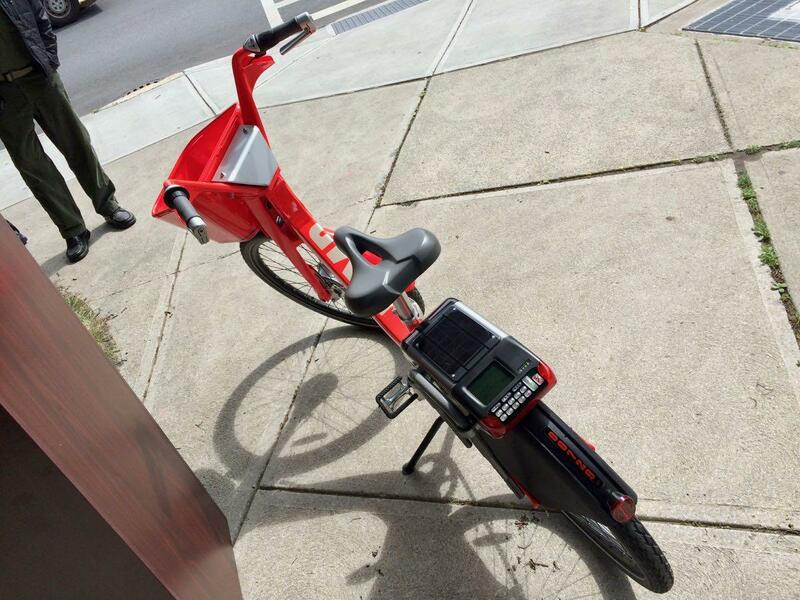 ... Folks are using these bikes at rates we've never seen in our standard bike share. So in Albany we're seeing like one trip per bike per day. In San Francisco we're seeing up to 10 trips per bike per day -- which is crazy because we only have 250 bikes on the road out there." Jacob said she had her own e-bike moment shortly after the Jump launch in Washington, DC. "I had to get to the train station to get back to New York. I had my suitcase and a backpack and I was wearing a skirt and it was September in DC -- and I got there in 15 minutes, no sweat. It was crazy," she said, laughing about the experience. "I was passing all these taxis and passing Ubers. It's just the easiest way to get around a city." + Curbed: Can dockless and station-based bike-share programs coexist? Riding that JUMP bike up hill was wild. It felt no different than riding on a flat surface. 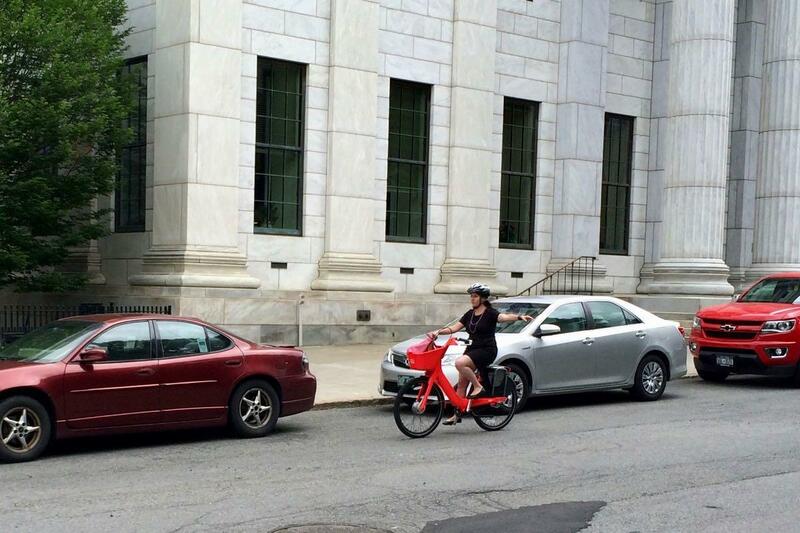 As Lauren Bailey put it, e--bikes really are a game changer for bikeshare. In hilly cities like Albany, Schenectady and Troy, incorporating e-bikes into bikeshare would make using CDPHP Cycle viable for so many more trips than we are seeing now. As AOA points out, NYC just completed a rule-making process that will allow low speed pedal-assist e-bikes to be used on city streets - this means the delivery workers will not need to worry about their bikes being confiscated by NYPD anymore, and e-bikes will soon be used in NYC bikeshare. Citibike in NYC has plans to incorporate e-bikes soon, plus NYC plans to roll out a pilot dockless bikeshare this summer in areas not currently served by Citibike that will likely include some pedal assist e-bikes (see articles below). 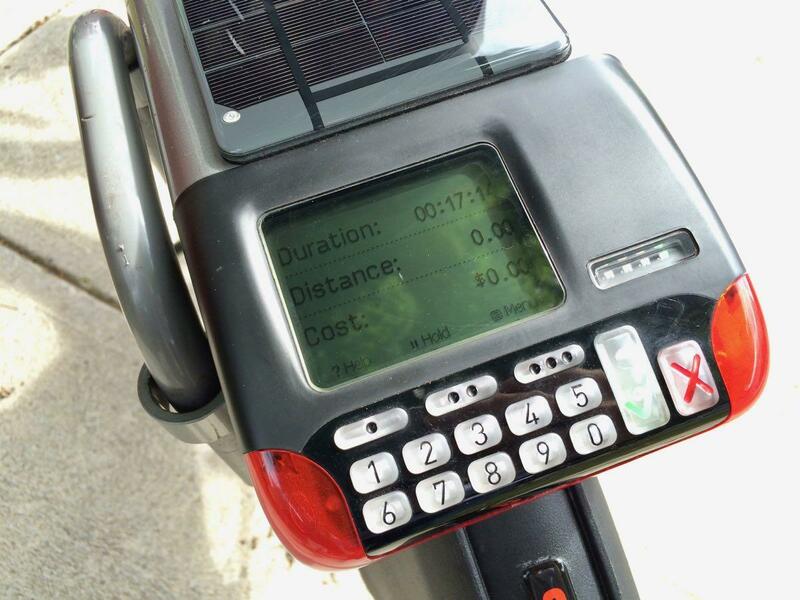 Unless the state legislature acts now, the rest of the state will be left behind, unable to even consider adding e-bikes into their bikeshare systems. What can we do to show support for this Leah?